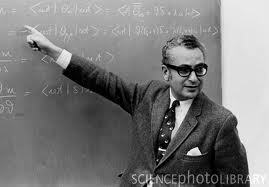 Murray Gell-Mann was born on 15th September 1929, in New York City. He obtained his B.Sc. at Yale University in 1948, and his Ph.D. in 1951 at the Massachusetts Institute of Technology. In 1952 he became a member of the Institute for Advanced Study, during 1952-1953 he was instructor at the University of Chicago, from 1953 to 1954 he was Assistant Professor, in 1954 he was appointed Associate Professor for research on dispersion relations. In this period he developed the strangeness theory and the eightfold way theory. In 1956 he was appointed Professor, his research then turned more to the theory of weak interactions. In 1959 Professor Gell-Mann was awarded the Dannie Heineman Prize of the American Physical Society. He is a Fellow of this society and a member of the National Academy of Sciences. Murray Gell-Mann was in 1955 married to J. Margaret Dow; they have a daughter, Elizabeth, and a son, Nicholas. Murray Gell-Mann is one of today's most prominent scientists. He is currently Distinguished Fellow at the Santa Fe Institute as well as the Robert Andrews Millikan Professor Emeritus at the California Institute of Technology, where he joined the faculty in 1955. In 1969 he received the Nobel Prize in Physics for his work on the theory of elementary particles. He is the author of The Quark and the Jaguar, published in 1994, in which his ideas on simplicity and complexity are presented to a general readership. Among his contributions to Physics was the "eightfold way" scheme that brought order out of the chaos created by the discovery of some 100 kinds of particles in collisions involving atomic nuclei. Gell-Mann subsequently found that all of those particles, including the neutron and proton, are composed of fundamental building blocks that he named "quarks," with very unusual properties. That idea has since been fully confirmed by experiment. The quarks are permanently confined by forces coming from the exchange of "gluons." He and others later constructed the quantum field theory of quarks and gluons, called "quantum chromodynamics," which seems to account for all the nuclear particles and their strong interactions. Professor Gell-Mann was a director of the J.D. and C.T. MacArthur Foundation from 1979–2002 and is a board member of the Wildlife Conservation Society. From 1974 to 1988, he was a Citizen Regent of the Smithsonian Institution. He belongs to the National Academy of Sciences, the American Academy of Arts and Sciences, the American Philosophical Society, and the Council on Foreign Relations; he is also a Foreign Member of the Royal Society of London. He was on the U.S. President's Science Advisory Committee from 1969 to 1972 and the President's Committee of Advisors on Science and Technology from 1994 to 2001. In 1988 Professor Gell-Mann was listed on the United Nations Environmental Program's Roll of Honor for Environmental Achievement (The Global 500). He also shared the 1989 Ettore Majorana "Science for Peace" prize. Earlier, he was given the Ernest O. Lawrence Memorial Award of the Atomic Energy Commission, the Franklin Medal of the Franklin Institute, the Research Corporation Award, and the John J. Carty Medal of the National Academy of Sciences. In 2005 Gell-Mann was awarded the Albert Einstein Medal. He has received honorary degrees from many universities, including Yale, Columbia, the University of Chicago, Cambridge, and Oxford. In 1994 the University of Florida awarded him an honorary degree in Environmental Studies. Gell-Mann's interests extend to historical linguistics, archeology, natural history, the psychology of creative thinking, and other subjects connected with biological and cultural evolution and with learning. Much of his recent research at the Santa Fe Institute has focused on the theory of complex adaptive systems, which brings many of those topics together. Currently Professor Gell-Mann is spearheading the Evolution of Human Languages Program at the Santa Fe Institute. Another focus of his work relates to simplicity, complexity, regularity, and randomness. He is also concerned with how knowledge and understanding are to be extracted from the welter of "information" that can now be transmitted and stored as a result of the digital revolution. Professor Gell-Mann lives in Santa Fe, New Mexico and he teaches from time to time at the University of New Mexico in Albuquerque.